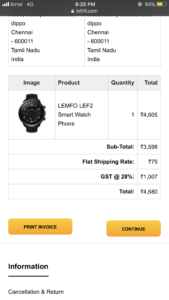 I bought a watch from a online shopping site named www.Infrill.com owned by Prestige Group & Co, as per the details they showed on their portal & i received an item which is completely different & cheap one. My ordered watch is of 4680/- and I got the watch which not even worth for 500/- many of them were cheated in this and most of them dont know what to do. They are doing this only because they are in India were people busy with lots of things and they don’t care about this small things, these lead to big mistake. kindly take strict actions against this company so these type of frauds can be prevented. They have cheated most of the people with fake advertisements and cheated hard earned money. There are many Fraud websites and pl do ban all. Common People not use of Digital India, this type of fraud company is well use of Digital India. Don’t let leave this as small complaint it leads to serious one if they start to think there is no one take action against them. Very agree with you. Many of us has been cheated by this company.I too ordered and felt cheated for this. Can you please share your number I am trying to collect all people who was cheated by this company so we could all meet at one whats group and Take action on those people. Hi I ordered MGCOOL EXPLORER 2 CAMERA- 4K and i got a fake one, which is prices at 899 only on amazon. i had paid 2200 for the product. please help me get the refund.